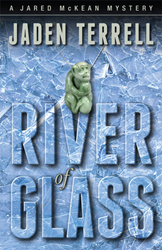 River of Glass author Jaden Terrell has started the Million Books for Freedom project to benefit victims of human trafficking by making a million dollar donation to anti-trafficking organization Not for Sale if a million digital copies of her book are sold by midnight of December 31, 2014. Everyone...can do something. It's an easy and painless way to do something good for the holidays. While searching the Internet for ideas for her third novel, Jaden Terrell came across this sentence: “There are more slaves in the world today than at any other time in human history.” It was followed by a number: thirty million. That statement inspired Terrell’s latest title, River of Glass, a thriller that tackles the issue of modern-day slavery. After reading the book, publishers Martin and Judith Shepard of The Permanent Press (Sag Harbor, NY) promised a donation to Not for Sale, an organization working to put an end to human trafficking, for each copy sold. In response, Terrell has created the Million Books for Freedom project: if a million digital copies of River of Glass are sold by midnight of December 31, 2014, she will write a check to Not for Sale for an additional million dollars. "I’m not a well-known author," Terrell says, "and donations from my typical sales would be pretty meager, so if I want to help raise awareness of this issue and allow for a larger donation, I need to do something dramatic." About Jaden: Jaden Terrell is the Shamus Award-nominated author of three novels featuring Nashville private detective Jared McKean and is a contributor to Now Write! Mysteries, a collection of exercises by Tarcher/Penguin for writers of crime fiction. Terrell is the special programs coordinator for the Killer Nashville conference and a Magnolia Award recipient for service to the Southeastern Chapter of Mystery Writers of America. The former special education teacher has a red belt in Tae Kwan Do, loves ballroom dancing, and is certified in equine sports massage.